The weekend was a busy one, with errands and housework taking priority - so nothing unusual there! I did find some time to cast on a pair of socks and did a tiny, token amount of spinning on my spindle. I also fell off the wagon, buying yarn both in Busy Fingers and from the stall in Coventry Market, which I made the mistake of checking out after recommendations from the ladies in Coventry's Knit-Wits. I also bought a book - Tweed - using a forgotten gift token left over from Christmas which needed using up... Or at least that was my excuse. Nice book with very tweedy jumpers in it which appealed to my need to stretch my knitting muscles. Things to aspire to. Saturday and Sunday afternoon, I spent quite a lot of time cleaning and oiling old sewing machines. 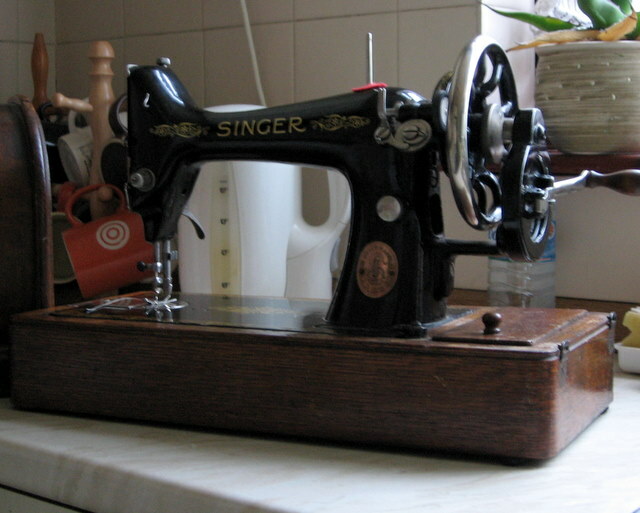 I can currently boast to having five sewing machines living in my little house, only one of which is actually used. One is my original sewing machine (really Dave's) which I retrieved from his sister's cupboard, not long after we got together and then learnt to sew on. I don't know how old this sewing machine is or the model, but I dug it out from where it's been hiding under a pile of fabric (which I'm still not talking about) so that I could fiddle with it. I have a tent which needs fixing and as nice as my Janome is, it's motor is going to really struggle to sew through several layers of canvas and I don't really have room indoors to easily manipulate the bulk. Something either driven by hand or by a far more powerful motor is going to be required as well as room to work. 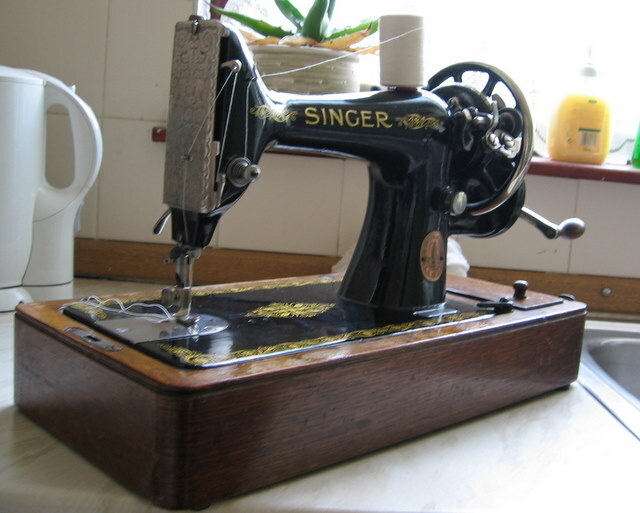 I've already broached the subject with Esther, who has an industrial sewing machine which could certainly whiz through the small amount of sewing involved, but in the meantime, I wondered about this old Singer hand crank. This beauty was given to Dave by his then land lady and he tells me he has sewn on it, but he couldn't tell me how to thread it or wind bobbins on it. Never mind though, I figured it out! First thing I did was to scold Dave for leaving it stored for all this time with the presser foot in the up position! Before trying to sew with it, I cleaned it thoroughly. I'm afraid the original foot attachments and bobbins are not much good as they are covered in rust and I'm not sure how to clean them. Any suggestions? The rest of the machine cleaned up well and after generously oiling every conceivable part, I was ready to play. Using my experience far and looking at pictures on the internet, I managed to get it sewing reliably by Sunday afternoon. The bobbin race gave me pause for thought. It oscillates, rather than rotating, but is a drop in rather than side inserting. It has a nifty little lever for popping the bobbin out when you're done, which I was impressed with. Figuring out which way round to put in the bobbin took some time, as did trying to see how to line up the thread with the notches, but I got there in the end. After a few hours, I had it working as reliably as I'd expect my Janome to be. The main problem area is going to be tension and stitch length, the knobs for which don't have any indicators so you know how much you've set them to. Instead, I tweaked the tension knob (on the tension plate spring) until I was getting a good tight stitch. 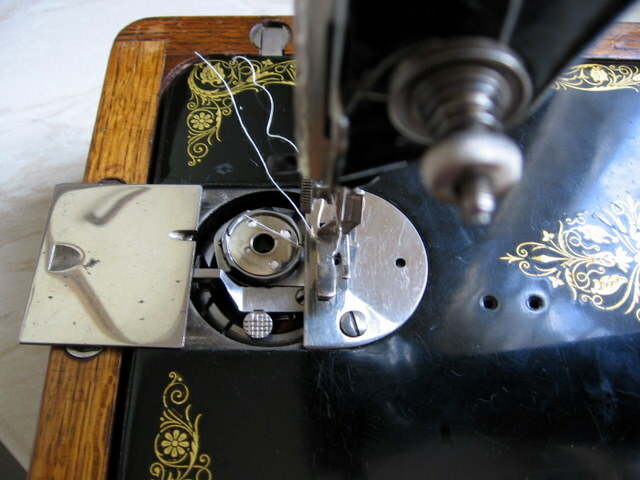 The stitch width selector is under the bobbin winder, discovered by trial and error and adjusted using a similar approach. The threading diagram so far... For sewing in red and bobbin winding in green. 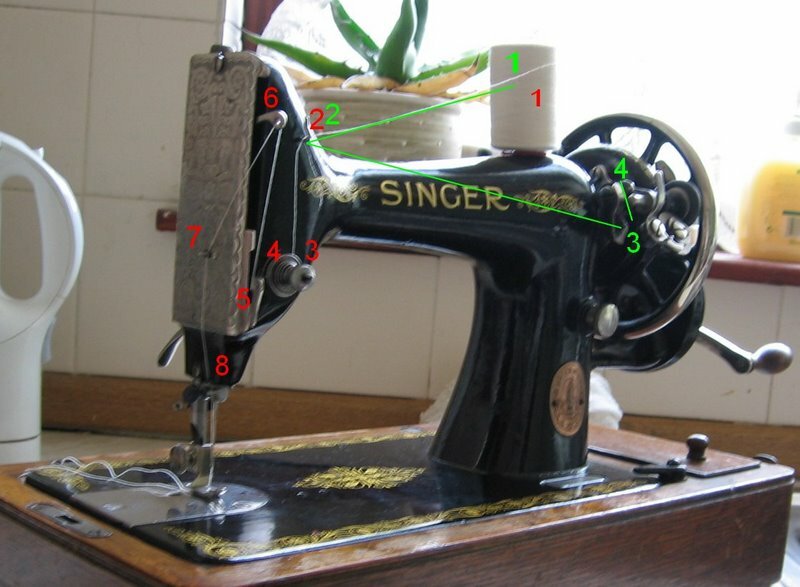 I think I'm going to email Singer with the serial number and see if I can get some basic operating instructions. While I think I've got the basics sorted out now, I still can't see how to drop the feed dogs. It only does a straight stitch but has all these wierd foot attachments, which may extend it's range somewhat... If I can clean them up of course. Oh my nan's got the very same model, still on its original pedestal in her brick outroom!